The Honda S660 is a mighty fine vehicle to look at straight out of the box, we reckon. Its pert dimensions, coupled to a number of quirky but loveable aesthetic cues here and there, help ensure that the little kei-roadster packs enough visual drama despite the relatively modest set of numbers it puts down on paper. For those who agree with the above, stop reading. For those who don’t (and there will be many), Mugen has the answer with its line-up of products specifically developed for the Honda S660. The Japanese tuner and parts manufacturer has released a catalogue consisting of reworked front bumpers, new 15- and 16-inch alloy wheels, a rear spoiler and a hardtop. Other changes include a front lip spoiler, more aggressive side skirts and a different hood design. On the inside, Mugen floor mats, a carbon-fibre rearview mirror cover (also available in chrome) and a carbon shifter knob are offered. Other aesthetic enhancements include Mugen badges and carbon registration plate frame. It’s not all about the looks, though. 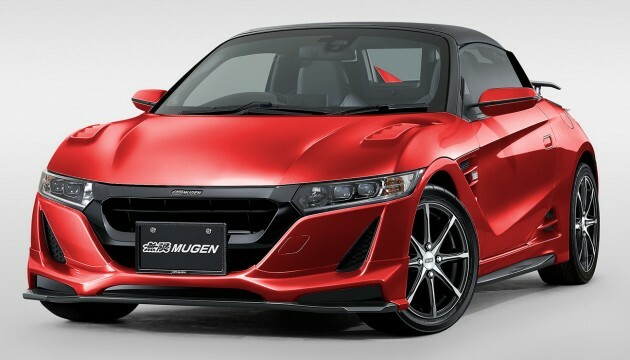 Mugen is also throwing in a sports suspension setup, stainless steel exhaust tips and “an improved braking system” along with performance-oriented oil filter as part of its list of upgrades for the Honda S660. This little cili padi can finally look the part. I second… just give the mugen hardtop as an option. If sold for 120k each, you want? lets play the game of Guess the price of this car when it comes to Malaysia. The car certainly doesn’t lack any visual drama, but the engine-side desperately needs more tweaking (boosting). At least 200hp would match its sporty outlook and raise many more eyebrows. Honda should learn a thing or two from the failure of the CR-Z in European market…. This car top speed is only 140km/h. Power is only 64 hp! Wtf! This is pondan car. A 1904 Rolls Royce has only 10hp. That’s old car, why bother to compare with this? Because Japanese regulations limit kei cars to only 64hp or thereabouts – thats why. You must remember that Honda has made motorcycle engines that small with more power without even using turbos. If the car pushes out more than 64hp, it would not be considered Kei anymore, and will taxed higher. Anyways, they are testing a 1.0 turbo for export market. I used to own the Honda Beat. That was 600cc and had 60hp. From my experience, it was awfully under-powered and uncomfortable to drive but the ‘cool factor’ was tremendous. For this model, if it is anywhere near the size of the Beat (or suzuki cappuccino), 120hp would be max I think. Don’t let the design fool you. It is a VERY small car. Almost like a go-kart. i dun mind cheap or expensive, just bring it here…. Bring in the latest civic concept from NYC. JUST BRING IT INNNN!!! !Been saving for MX5 but too slow. This is no pondan car. Its rolling out of the factory with Yokohama AD08R on all four wheels. I’m sure the Honda engineers isn’t gonna fit those rubbers on it if it wasn’t meant to take corners quickly. This could just be a little pocket rocket! indeed a nice compact car…good to see if Honda able to bring this car :) don’t mind getting given the price is reasonable. Honda ivtec alone no turbo also powerful n super reliable already. But this car is handsome.Any chicks would love to be in it and they will be so happy to grab your ‘gear knob’ also.